Greetings Space Cadets, Many things puzzle the human mind from time-to-time. And while we can all sit around contemplating the harder questions in life, it’s far more fun to talk about issues that don’t necessarily effect the real world. For example, how much would it cost to be Batman? Of course, to be the nighttime hero, you firstly have to have a coarse voice, otherwise you’re getting nowhere. And, as it turns out, you’ve got to have a bank account that can harness the earnings of three footballers. 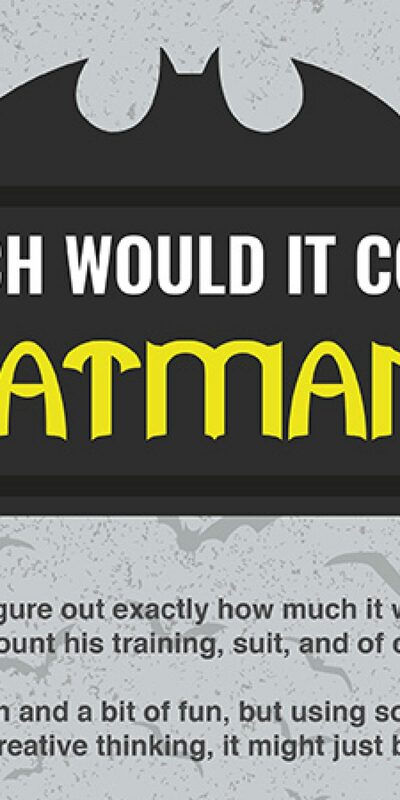 The people over at Twizzle decided to set about answering the question of how much it’d cost to be the caped crusader. Now, there are a few problems when estimating the cost, the first one being that Batman doesn’t actually exist. However, why should that stop anyone from pondering anything. Using the version of Batman from Christopher Nolan’s Dark Knight trilogy, they used various sources and some creative thinking to mock-up an infographic of how much things like the suit and training would set you back. The suit itself would apparently cost £243,000, being made from ‘super strong Nomex’, originally intended for advanced military use. It also has a Kevlar bi-weave, which stops slashes and bullets, undoubtedly adding on a big chunk of cash. The vehicles our bat friend uses are obviously quite an expense, with the ever-famous ‘Batmobile’ costing £812,000. Kitted out with weapons and stealth capabilities, it’s an important part of Bruce Wayne’s arsenal. It also comes with the Batpod, a motorcycle which is used as a sort of escape pod that costs £329,000, according to Twizzle. The gadgets the hero carries aren’t anywhere near as expensive as the rest of his gear, a grapple gun costing the most at £2,389. All together, things like a hand held grenade launcher, smoke bombs and night vision goggles come to £6,559.80. All in, if you’re looking to become Batman, you’ll need £27,536,205.10. Sorry to anyone who happens to have £27,536,205 but can’t find a 10p anywhere. 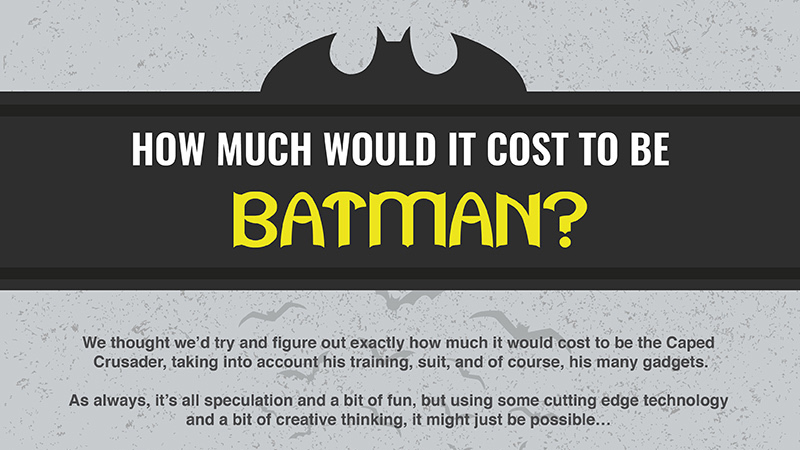 This Is How Much It Would Cost To Be Batman? Reviewed by DR Ravenholm on March 13, 2017 .